Both the PowerShot A570 IS and the PowerShot A560 digital cameras are built with the kind of intuitive engineering that makes taking great pictures as simple as pointing and shooting. From the cameras' Face Detection technology that detects multiple human faces in a scene and the new Red-eye Correction feature that greatly reduces that cursed condition that can occur with flash photography, to the on-board Intelligent Orientation Sensor that automatically detects whether the camera is being held and shot vertically or horizontally, these Canon cameras give users the freedom to shoot and share their photos with incomparable ease. The new models also feature a large and bright 2.5-inch 115,000 pixel LCD color display, making it easier to review captured images, perform on-camera editing and read and select menu options. The "brain" of these new PowerShot A-Series digital cameras is DIGIC III, the newest iteration of Canon's ultra-efficient (and proprietary) image processor. Previously available only on Canon's most advanced digital cameras, the DIGIC III image processor accounts for the camera's higher performance levels including faster start up, autofocus and shutter response times, improved image quality and more efficient power consumption; resulting in extended battery life under typical shooting conditions. In addition, the DIGIC III image processor has a more aggressive noise reduction algorithm enabling PowerShot A-Series owners to shoot at ISO equivalent speed ratings from 80 to a super high 1600 for increased low light photo flexibility. This sensitivity at the top-end allows the camera to utilize faster shutter speeds, significantly reducing the effects of camera shake and subject movement during hand- held or low-light photography. 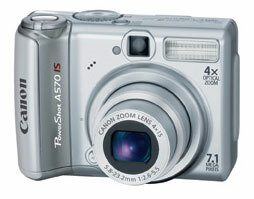 The 7.1 megapixel PowerShot A570 IS digital camera takes its place as the new "A" team value champ with its impressive 4x (35mm-140mm equivalent) zoom lens and Canon's advanced Optical Image Stabilization (OIS) that significantly reduces the effects of camera shake (and the ruined pictures they cause). No mere electronic optical illusion that can diminish image quality in the cause of modest image stability, Canon's "lens shift" optical system actually allows the lens to physically compensate for camera movement, even when that movement is caused by extended telephoto or low-light shooting conditions. The PowerShot A570 IS Digital Camera's OIS is firmly rooted in the technological advances made by Canon in the design and construction of its professional EOS SLR and professional video lenses. Adding to the camera's optical excellence is its fast lens (opening up to f/2.6 at wide-angle settings and f/5.5 at telephoto settings). The PowerShot A570 IS digital camera's great range of functions can be enhanced and expanded with any one of three optional converter lenses - a tele-converter, a wide converter or a close-up lens for macro photography - that attach to the camera's zoom with the addition of an optional conversion lens adapter. The PowerShot A570 IS digital camera accommodates MultiMedia MMC memory cards as well as standard SD memory cards and the new, high capacity SDHC memory cards. In stores beginning in March 2007, the PowerShot A570 IS digital camera kit carries an estimated selling price of $279.99 and includes two standard AA alkaline batteries, a 16MB MMC Memory card, a USB interface cable, an AV cable a wrist strap, and Canon's software suite. The 7.1 megapixel PowerShot A560 digital camera captures nearly all of the imaging advances of the PowerShot A570 IS digital camera. Like its image stabilized A-series teammate, the PowerShot A560 digital camera features a smooth 4x (35mm-140mm equivalent) zoom lens and a bright 2.5-inch LCD screen. Here again, its comfortable construction and grip snugs the camera firmly into the user's hand and its automatic, intuitive features make the PowerShot A560 digital camera a snap to use under virtually any shooting conditions, including often difficult low-light circumstances. This low-light effectiveness is due in large part to the pairing of the camera's fast (f/2.6 - f/5.5) lens, it's top-end super-high ISO of 1600 and of course, the myriad blessings bestowed by the DIGIC III image processor. Formidable yet phenomenally user-friendly, the PowerShot A560 digital camera maintains the high quality and high affordability factors that PowerShot A-Series cameras have come to represent. The PowerShot A560 digital camera accommodates MultiMedia MMC memory cards as well as standard SD memory cards and the new, high capacity SDHC memory cards. In stores beginning in March 2007, the camera includes two standard AA alkaline batteries, a 16MB MMC memory card, a USB interface cable, an AV cable, a wrist strap, and Canon's software suite at an estimated selling price of $229.99.